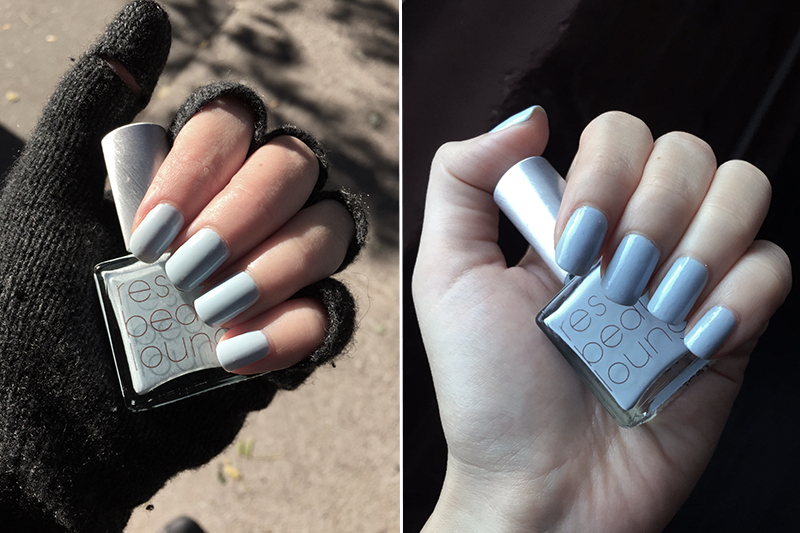 I'm a sucker for baby blues, so when Rescue Beauty Lounge unveiled its latest collaboration with Refinery29, I ordered Better Than Boyfriend Jeans without skipping a beat. It is such a pretty icy blue – it reminds me of Dior Glacier (less blue and more silver, shimmery) which I missed out on years ago. BTBJ is a different polish under varying light. It picks up more blue when indoors, and takes on a glacial quality when under sunlight. I needed three layers to get it to full opacity (apply with a light hand to avoid streaks). I think it'll be beautiful peeking out of gloves when the snow hits. The only other color I purchased from the collection was another in-between shade, the green/blue called Sunny Skies. It's a pity that my mind was an auto-mode when I ordered the two shades, because now I'm regretting not getting Pretty Gritty, a purple with fine gold shimmer. I own the original IKB, which is why I didn't spring for All About Yves, though I've heard that the latter has a superior formula. You can enjoy swatches of the rest of the collection at Makeup Withdrawal. The R29 + Rescue Beauty Lounge collection is exclusively available on rescuebeauty.com. Each polish retails for $20.